Construction of the British Telecom Tower started in 1961, designed by Chief Architect, Eric Bedford and Senior Architect in Charge, G.R.Yeats. Opened in 1964 the tower stands the 189m (620ft) to dominate the skyline of north central London. At the time of opening the tower was the tallest building in the United Kingdom and remained so until the Natwest Tower was completed in 1980. The towers main role is one of communications, relaying radio, satellite, television and telephone signals around the country. 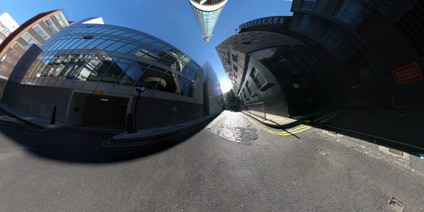 View the Quicktime panorama of The British Telecom Tower, London (2.5mb).